This Blog is dedicated to everyone, who wishes to enrich and share all knowledge about healthy living, health problems and various type of sickness and to understand the healing abilities of our human body. DISCLAIMER : All information and articles posted herewith, are extracted mostly from renowned web sites and, is in no way intended to be a substitute for modern medical care. Do not self-treat any medical complaint without the guidance of a licensed health care provider. 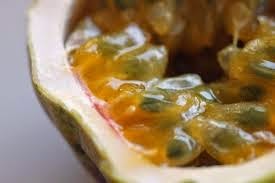 This fruit is native to subtropical wild regions of South America, probably originated in Paraguay. Its plant is an avid climber (a type of vine) which grows on anything (for support) and is a shallow-rooted vine that climbs by means of tendrils. The passiflora plant requires well-drained fertile soil and good moisture to flourish, especially with abundant sunlight. It grows quickly and reaches about 15-20 feet per annum once matured. Its average life span is about 5-7 years. Although there are many varieties in this fruit, but ... only two main types i.e. the purple and yellow colored varieties are widely cultivated. 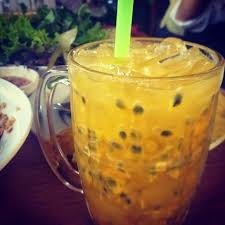 The passion fruit features round to oval shape, about 4 to 8 centimeters in diameter. It has a tough outer shell (rind) and could weigh between 35-50 gm per fruit, averagely. . Inside this fruit, it contains membranous sacs that are light orange in color, comprising of small, hard, dark-brown or black, pitted seeds. The yellow variety is generally larger than the purple type. But, the pulp of the purple fruit is said to be less acidic and also, richer in aroma and flavor, including a higher proportion of juicy pulp. It contains a good level of Vitamin A (about 1274 IU per 100 gm) and flavonoid antioxidants, such as β-carotene and cryptoxanthin-β. The later compounds are known to have strong antioxidant properties, which are beneficial for good eye-sight, lung and oral cavity cancers. 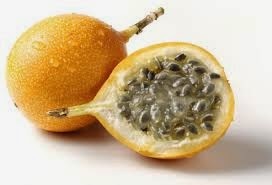 Its granadilla is a good source of minerals, namely; iron, copper, magnesium and phosphorus. 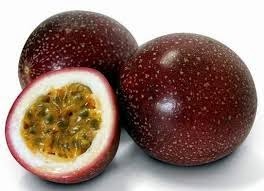 Today, the pulps of passion fruit are widely processed to make delicious fruity juices, including a whole range of other uses namely; fruit jam, yoghurt, toppings for cakes and also in the manufacturing of soap, shampoo, aromatic fragrance agent and even body lotion etc. What is Jock Itch ? What is Shingles (Chinese called it Snake Disease) ? What are Skin Tags ?